They say that "Change Is As Good As A Holiday"! Just a few new accessories to add some colour or set a new tone can make a world of difference. If you're on a budget, there's no need for a complete overhaul to change up your look. Think op-shop chic; an eye-catching teapot, patterned serving platters displaying fresh fruit, or some potted colour with hand-knitted or crocheted covers in a complementary shade. These pieces catch the eye and change the overall tone of the room whilst working in with your existing furnishings. A sideboard or open display shelf (above) offers an ideal opportunity to regularly change the feel of the room simply by rotating what you choose to display. Travel from French Provincial to Summer Beach House to Cosy Farmhouse in an otherwise neutral kitchen simply by selecting a few items to leave on view, and tucking the others away in a kitchen cabinet, within reach but out of sight. Items such as vases or shelf knick-knacks can also be rotated from room to room; the new context breathes fresh life into pieces you already own and love (best of all, for free!). 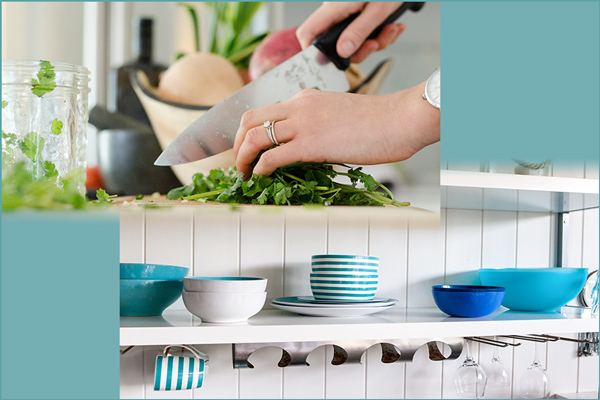 The kitchen is the heart of your home, so using your crafting skills to create a space which inspires you will pay daily dividends when it comes to mealtimes! Simple Refresh Project 1: add a splash of colour to the kitchen sink. You spend so much of your day at the sink; you might as well enjoy your time there! These soft pure cotton dish cloths are an absolute delight to use, and their unique appearance will become a talking point next time your guests pop over for a cuppa. Click here or on the picture to see the free pattern. Simple Refresh Project 2: easy drink coasters. Coasters are a quick and easy knit to whip up when setting out items for your latest shelf display. Mix and match shades (as pictured), use shades within the one family, or have a matching set in your favourite colour. You can then carry these coasters out into the alfresco entertaining area during your next Summer BBQ. Click here or on the image to see our free pattern. Simple Refresh Project 3: decorative tea cosy. Your teapot makes a regular appearance when guests drop by, so a new cover can become a signature piece in your kitchen. The intricate patterning of this design will forever keep your secret... it's actually an easy knit. Click here or on the image to see the pattern. We hope you've found a few ideas to tempt you into crafting your own kitchen makeover this year! Feel free to drop us an email at stokesay@bigpond.com with your own crafty kitchen refresh ideas!